Wicked Wack Women’s Weekend with Calories! Last weekend was the celebration of the first of our group of six to mark a major milestone! Yea! Randi!!!!! We weren’t really that wicked but it was great alliteration! It was a Friday to Sunday with only two nights in a wonderful chalet halfway up a mountain I never got to see the top of because of the fog and snow. But I’m not complaining. The”Wack” in the title refers to the area we were in – Chilliwack. What do you call people from Chilliwack? Chilliwackians? Chilliwackites? Chilliwackos? Never mind, someone will tell me some day and I’ll be disappointed. Brenda and Karla flew in from Calgary and stayed at Lynn’s overnight and drove there with her. I picked up Randi and Wendy on the Island, where we three live, and caught the 7am ferry to the mainland. We made it around 11 am and arrived just after the others. Anyways, we did some pre-planning for the ladies’ weekend with Lynn doing the grocery shopping and setting up the menu with all of our input. We picked her because she lives in Hope, near Chilliwack and has a van. Two of us do not drink coffee, one cannot handle milk products, we are all health conscious and it was only for two lunches, two dinners and two breakfasts. We were not supposed to bring anything. Except, I said I would bring the coffee (Kicking Horse 454, mmmmm), something to put in it and some wine. So when we unloaded the two cars we had a large box, a cooler and 5 bags of food and alcohol. Oh my God! So much stuff! I had promised myself that I would keep my food journal all weekend to stay good. There was no wireless and no bars on my phone so I felt like one of my addictions was going to have go cold turkey. But it turned out that this wasn’t a real issue until all of us were trying to remember names, places and dates form the last 38 years and Karla (IPad) and I (laptop) couldn’t get a Google in sideways! Hmm we managed fine. I had actually created my food journal form on this computer so I had no excuse to not record what I was eating and drinking. And I did! Sigh, the alcohol. I brought a box of pinot grigio, a container of chocolate cupcake martinis, a small bottle of Carolans (Irish cream liqueur) and a marvellous bottle of Chocovin ( a chocolate wine from the Netherlands). 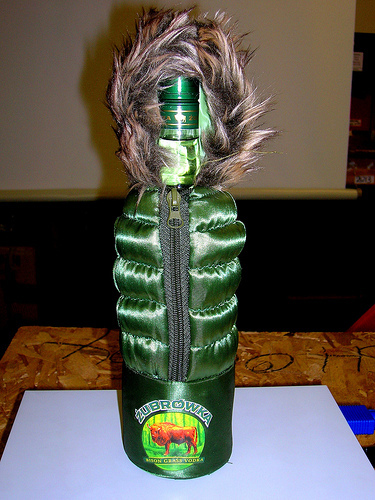 I brought it in a ski jacket I got from a bottle of bison grass vodka. Wendy brought two bottles of white wine. Lynn, Karla and Brenda brought: two bottles of red wine (including a merlot that Lynn made that disappeared very quickly); a very small bottle of Grand Marnier (wonderful in the coffee, tea and milk); Kaluha; another bottle of Carolans; Orange and Brandy liqueur (I don’t think we even got that far); 6 Caronas, 6 Seagram’s Ice, 6 Mott’s Caesars. Not a lot went back home but, then, it did snow while we were there. And juice. Cranberry juice. I drank juice. Honestly! And the food…chicken chilli with homemade tea biscuits (Lynn even brought jams she had made), BBQ’d chicken breasts with baked sweet potato fries and Chinese salad; fresh pineapple, bacon and smoked salmon scrambled eggs; skinny cheese, veggie and cold cut sandwiches; bruschetta and smoked salmon snacks; pretzels and Cuban peanuts; maple-marinated pork tenderloin, baked sockeye salmon, veggie salad, and roasted asparagus; then omelettes and cantaloupe for breakfast the day we left. Now, it was a birthday celebration, so we needed some sort of celebratory baked good for the occasion. Lynn (She is a Goddess!) made a banana cream pie and a milk/gluten-free chocolate cake. OMG!!!!! With real whipped cream (of which I only had a smidgeon, of course). So much talking, laughing and playing. We even managed to squeeze in a couple of movies and Yahzee. (Satellite TV wasn’t hooked up and that was a good thing.) We watched “The Help” and “Mamma Mia”. The six of us sang along with all the ABBA songs remembering when we disco danced to them many moons ago. I brought my exercise band with me and got a good upper body work out while looking out the picture window into the dawn over the mountains facing us. My guilt lowered a wee bit. But the time to leave came quickly and with many sighs and hugs the two groups separated and home we went. It was a wonderful weekend and I did feel wicked but there was no badness to it anywhere. ~ by 1fatgirlshrinking - Diane Kirby on March 14, 2012.